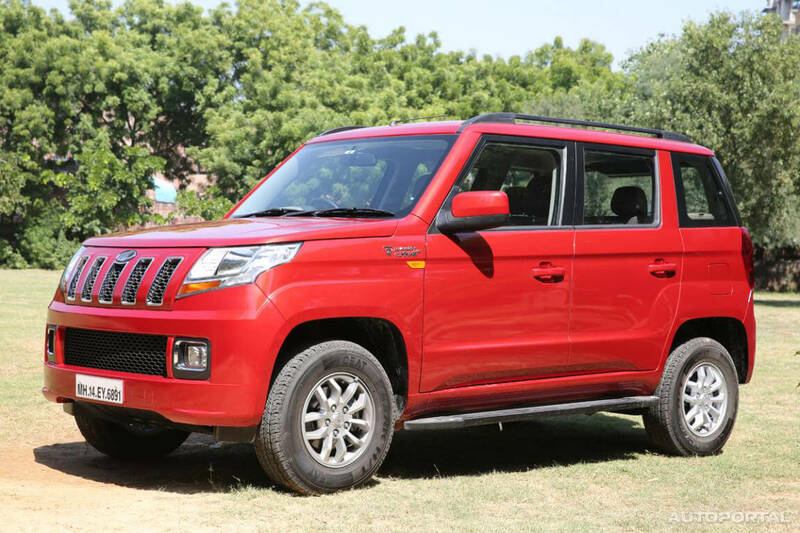 Mahindra TUV300 was the company’s first new-gen compact SUV. This made its entry after the company experimented with the Quanto. That vehicle didn’t do well due to multiple reasons and Mahindra did have a lot of learnings from that. The Mahindra TUV300 did have the tough and bold looks, it did appeal to many, but there were an array of launches that affected the sales. One of the major reasons was lack of power from the engine. Hence, this 1.5-litre got an upgrade in power to 100bhp making it good enough in performance. The AMT variant was also offered on the 100bhp engine. Front is bold, the engine hood is short and front apron is unusually wide. Radiator grille is reminiscent of Jeep and a hint of chrome is evident around the rectangular openings. Head lights are designed in such as way that fits well with the bold front end. Body coloured lower bumper gets square shaped fog lights featuring chrome surrounds. Air inlets are again wide that add to the aggressive stance. Wheel arches are rather rectangular than round, side view is simple, the black treatment around the window frame, dual tone power adjustable ORVMs, body painted outside door handles and window beltline altogether lends a suave look. Rear too has been designed in line with the rest of the body, a set of simple tail lights and mounted spare wheel are equipped on the tailgate. And the black painted roof rails have been atop appear sport. 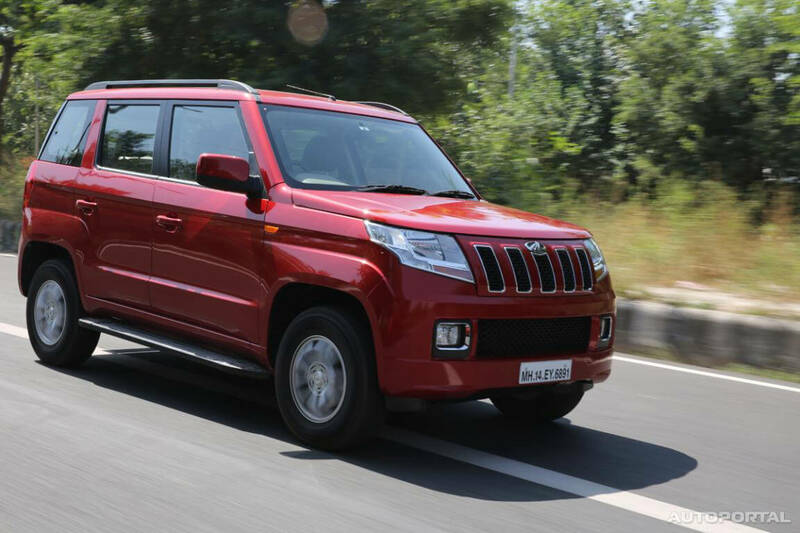 When Mahindra launched the TUV300, we wondered why it was producing lesser output than the Quanto. Then the NuvoSport was launched and we still were dumbstruck as to why the TUV300 still made lesser power. The vehicle now gets the same engine tune as the Quanto replacement, thus the 1.5-litre, 3-cylinder engine produces 100 BHP of power at 3750 RPM which is a full 16 BHP more while torque has increased by 10 Nm to 240 Nm between a higher band of 1600 to 2800 RPM. Using a twin-stage turbocharger, the added punch from the engine is hard to notice in city driving as both the engines have good low-end pep. However, stretch the powerplant into the mid-range and the wider torque band gives the Mahindra TUV300 a better mid-range with added pulling power, no more going out of breath so quickly. Our VBOX tests show a 0.89 seconds gap between the two cars in doing the 0-100 km/hr sprint, the mHawk100 model taking 16.41 seconds. The motor is still quite noisy post 3500 RPM and redlines at 4800 RPM in first, 4700 RPM in second and 4500 RPM in third onward gears. The ton itself comes in fourth which robs away crucial time in the sprint to 100 km/hr while at the same speed in top gear, the tacho spins at 2500 RPM. The Mahindra TUV300 is comfortable doing 100 km/hr and push it hard, it will reach 120 km/hr without much fuss unlike the mHawk80 model which struggled. There is an Eco mode which restricts RPM to 4000 RPM and voice command system shouts out loud “Your TUV300 is in Eco mode”. There is also a stop-start system which helps in increasing mileage but fuel efficiency has fallen from 18.49 km/l to 18.05 km/l (ARAI). The TUV300 mHawk100 is offered in both manual and automatic transmissions, both being 5-speed units and the AT is an AMT (the mHawk80 now gets AMT as made to order). The 5-speed manual gearbox offers decent shifts but could be smoother.